For your convenience, we accept cash, personal checks, debit, CareCredit, and most major credit cards. Payment is expected at the time services are performed and we do not offer any in-house payment plans. 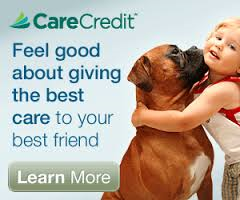 Please click on the picture below if you would like to apply for CareCredit. Feel free to contact our office with any questions about payment options.